Like many anglers I have been fascinated with spey casting, without really having much application for it in Hawke’s Bay. There is one particular pool in the Tukituki that I fish a lot in the spring, with a big high bank on one side and a deep bank on the other. A big lump of limestone in the middle of the river has plenty of fish rising in the spring, fish that will readily take a well presented dry or emerger. Unfortunately it is a bit out of reach of my normal single handed rod without getting wet up to my chest to wade through a gut to get into position to make a cast. It does shallow up so it is only waist deep but it is a bit too deep to wear waders, and usually pretty cold in the spring when the rise is at its best. This one spot has meant I have bought a 7wt Switch Rod, and 5wt Microspey so I dont have to wet wade up to my chest. I also bought a single handed spey line so I could fish on the swing while waiting for the rise to start. Despite being fascinated with Spey casting and a very competent single handed caster I have never really mastered the two handed spey casting. Part of this is because I have never sought out a good casting instructor, and the usual instruction days are in the middle of the upland season so I am unable to go. Part of it is because I can usually find a small stream with rising fish, so I have not practiced enough spey casting. The most important factor was I never really understood spey casting despite having all the casting DVDs I can find, and spending a lot of time watching videos online. 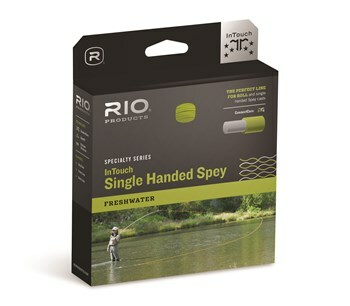 What changed my understanding of spey casting, and my spey casting ability was watching the Rio “How To Make a Single Handed Spey Cast”. This video is absolutely brilliant, explaining the positioning of the line i really simple to understand language with great demonstrations of different casts and the basic casting mechanics. This is my favourite casting video and the one I return to repeatedly in an attempt to perfect my spey casting.